No, it's not a flashback. 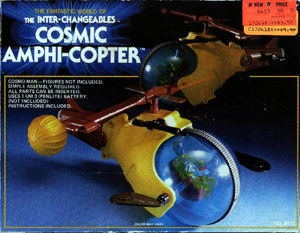 This is the garishly colored Cosmic Amphi-Copter; the Inter-Changeables' equivelant to the Hydrocopter. There isn't much to be said here. It is identical to the Hydrocopter except for the coloration and the quality of the plastic used to make the toy. We've been told that most, if not all, Inter-Changeables came in at least two different color schemes. The second color scheme is supposed to be silver and black, so there might be a silver and black Amphi-Copter out there! That would be infinitely cooler than this garish one!